Hygge is the Danish way of life of finding the coziness in simple things. It means cuddling up in a bed in a knit blanket with a cup of tea, having a hot bath in the morning and spending time by candlelight with your loved ones. Hygge is at home, it’s in the way you prepare food, it’s in your daily rituals, and it’s in the way you decorate. And while it’s best known to help you survive a cold winter, it extends to all seasons whenever you seek comfort and coziness. A lot of people have found interest in this concept, as evident by how it trends on Pinterest. 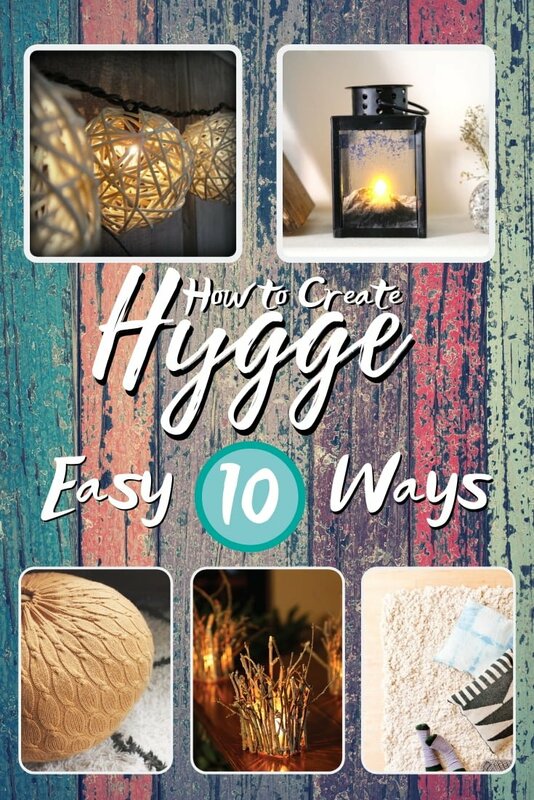 If you want to give it a shot too, get yourself a bunch of pillows, knit blankets, a cup of hot cocoa and get ready to learn a few easy DIY crafts that will help you create Hygge at home. You can create a wonderful cozy mood lighting with string light lamps – and that’s nothing new. But styling your lights to add a rustic decor accent moves your Hygge up another notch. This simple project shows you how to create lovely grapevine string light orbs. Having your favorite mug to drink your coffee is a big part of your morning ritual. To create more Hygge, make your own personalized mug design that’s all about you with this simple craft project. Hygge is also all about happy moods and your home decor should reflect that. And while this style is far away from eclectic, some accents like a tassel garland is just right to create the right vibe. Having dinner with your loved ones in candlelight is what Hygge is all about. Create some handcrafted rustic candle holders to create the vibe. This project makes use of twigs for a set of adorable rustic candle holders. A comfy pouf is a great addition to your room decor in Hygge style. Even better if you can make one yourself. Here’s a project for making a pouf from an old sweater. A plush area rug adds a lot of softness to the room and that’s so important to create a cozy vibe. Make this plush rugby following the tutorial for more Hygge at your home. Since mood lighting is so important to create the right vibe and decorate your home, a decorative handmade lantern will go a long way. And while there are many ways to make a lantern we especially like this mountain scenery one. Dip-dyed decor accents make it easy to add variety in color without going overboard. Since Hygge is all about simple things, ombre colors you get in the process are just right. Your nook where you can cuddle up with a book is a big part of the Hygge lifestyle so you need to create the perfect place for yourself. Use lots of pillows and knitted blankets, create a bed canopy to top it all off.